As I have written here, the DevOps Platform (aka ADOP) is an integration of open source tools that is designed to provide the tooling capability required for Continuous Delivery. 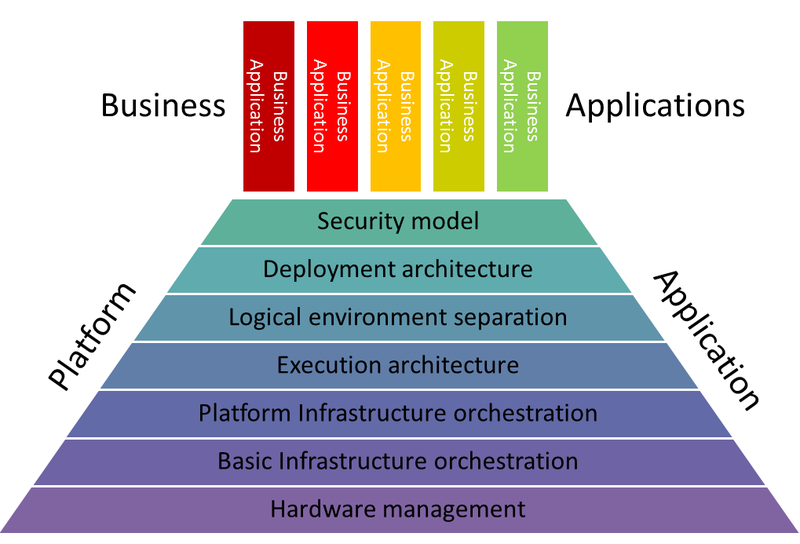 In this blog I will describe integrating ADOP and the Cloud Foundry public PaaS from Pivotal. Whilst it is of course technically possible to run all of the tools found in ADOP on Cloud Foundry, that wasn’t our intention. Instead we wanted to combine the Continuous Delivery pipeline capabilities of ADOP with the industrial grade cloud first environments that Cloud Foundry offers. The second to build and test the application code and deploy it to an environment built on the Platform Application. The beauty of using a Public PaaS like Pivotal Cloud Foundry is that your platforms and environments are taken care of leaving you much more time to focus on the application code. However you do of course still need to create an account and provision your environments. Trigger the Continuous Delivery pipeline. Performs functional testing using Selenium and some security testing using OWASP ZAPP. Performs some performance testing using Gatling. Kills the running application in environment and waits to verify that Cloud Foundry automatically restores it. Deploys the application to a multi node Cloud Foundry environment. Kills one of the nodes in Cloud Foundry and validates that Cloud Foundry automatically avoids sending traffic to the killed node. The beauty of ADOP is that all of this great Continuous Delivery automation is fully portable and can be loaded time and time again into any ADOP instance running on any cloud. There is plenty more we could have done with the cartridge to really put the PaaS through its paces such as generating load and watching auto-scaling in action. Everything is on Github, so pull requests will be warmly welcomed! If you’ve tried to follow along but got stuck at all, please comment on this blog. This is my fourth post in a series I’m writing about impedance to doing continuous delivery. Click these links for earlier parts about the trials of Infrastructure, Solution Complexity and COTS products. On the subject of Continuous Delivery where the intention is to fail fast, it’s actually rather sloppy of me to defer talking about people my fourth blog on this. When it comes to implementing Continuous Delivery there is nothing more potentially obstructive than people. Or to put things more positively, nothing can have a more positive impact than people! Here are my top 4 reason that people could cause impedance. #1 Ignorance A lack understanding and appreciation of Continuous Delivery even among small but perhaps vocal or influential minority can be a large source of impedance. Many Developers and Operators (and a new species of cross-breeds!) have heard of Continuous Delivery and DevOps, but often Project Managers, Architects, Testers, Management/Leadership may not. Continuous Delivery is like Agile in that it needs to be embraced by an organisation as a whole, simply because anyone in an organisation is capable of causing impedance by their actions and the decisions they make. For example the timelines set by a project manager simply may not support taking time to automate. A software package selected by an architect could cause a lot of pain to everyone with an interest in automation. A solution to this that I’ve seen work well has been awareness sessions. Whatever format that works best for sharing knowledge (brownbag lunches, webinars, communication sessions, memos, the pub etc) should be used to make people aware of what Continuous Delivery can do, how it works, why it is important, and what all the various terminology all means. I once spent a week doing this and talked to around 10 different projects in an organisation and hundreds of people. It was a very rewarding experience and by the end of it we’d gone from knowing 1 or 2 interested people to scores. It was also great to make connections with people already starting to do great things towards the cause. We even created a social media group to share ideas and research. #2 Ambivalence? As I’ve discussed before some people reject Continuous Delivery because they see it as un-achievable and / or inappropriate for their organisation. (Often I’ve seen this being due to confusion with Continuous Deployment.) Also, don’t overlook a cultural aversion to automation. In my experience it’s only been around 5 years since the majority of people “in charge” were still very skeptical about the concept of automating the full software stack preferring. A solution here (assuming you’ve revisited the awareness sessions where necessary) is to organise demos of any aspects of Continuous Delivery already adopted and demonstrate that it is real and already adding value. #3 Obedience Another source of impedance could perhaps be a misguided perception that Continuous Delivery is actually forbidden in a particular organisation. So people will impede it due to a misinformed attempt at obedience to the management/leadership. Perhaps a management steer to focus only tactically on “delivery, delivery, delivery” does not allow room for automation. Or perhaps they take a very strong interest in how everything works and haven’t yet spoken about Continuous Delivery practices, or even oppose certain important techniques like Continuous Integration. Or perhaps a leadership mandate to cut costs makes strategic tasks like automation seem frivolous or impossible. A solution here is for management/leadership to publicly endorse Continuous Delivery and cite it as the core strategy / methodology for ongoing delivery. Getting them along to the above mentioned training sessions can help a lot. Getting them to blog about it is good. As can be setting up demos with them to highlight the benefits of automation already developed. Working Continuous Delivery into the recognition and rewards processes could also be effective (if you please C suite!). #4 Disobedience Finally, if people know what Continuous Delivery is, they want it, they know they are allowed it, why would they then disobey and not do it? Firstly it could be down to other sources of impedance that make it difficult even for the most determined (e.g. Infrastructure). But it could also easily be a lack of time or resources or budget or skills. Skills are relatively easy to address so long as you make time. Depending on where you live there could be masses of good MeetUps to go and learn at. There are superb tutorials online for all of the open source tools. #FreeNode is packed with good IRC channels of supportive individuals. The list goes on. Another thing to consider here is governance. As I’ve confessed before, some people like me really like things like pipeline orchestration, configuration management, automated deployments etc. But this is not the norm. It is very common for such concerns to be unloved and to slip through the cracks with no-one feeling accountable. Making sure there is a clear owner for all of these is a very important step. Personally I am always more than happy to take this accountability on projects as opposed to seeing them sit unloved and ignored. 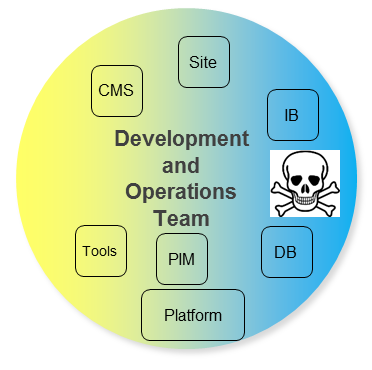 Finally as I’ve said before, DevOps discussions often focus around the idea that an organisation has just two silos – Development and Operations. But in my experience, things are usually lot more complex with multiple silos perhaps by technology, release, department etc., multiple vendors, multiple suppliers, you name it. Putting a DevOps team in place to help get started towards Continuous Delivery can be one effective way of ensuring there is ownership, dedicated focus and skills ready to work with others to overcome people impedance. Of course heed the warnings. Obviously overall People Impedance is a huge subject. I hope this has been of some use. Please let me know your own experiences.